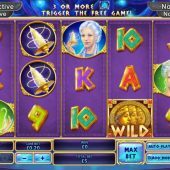 Fate Sisters slot belongs to Playtech's 'Age of The Gods' (AOTG) series and this time we get a more feminine subject, the three 'Moirai' so as with all the other AOTG games, such as Age of The Gods itself and Furious 4 we have an Ancient greek Mythological theme. The Moirai or 'Fates' were 3 sisters of destiny - Clotho, spinning the thread of life, Lachesis who drew lots to decide how long one lives and Atropos who chose when someone died by cutting their thread with shears. Now these powers are quite frightening and they sound like 3 sisters you really want to please, so how will your bankroll fare when hung from these very fine threads? Unlike most of the AOTG series we get 25 pay lines as opposed to 20. There are still the same 5 reels of 3 rows each with soft purple backgrounds which are set over a night scene in a mysterious temple, and the music is tinged with a haunting suspense to complete the atmosphere. Now it was written that the 3 Fates were mean, ugly and old sisters, but Playtech have given them attractive faces under their silver hair and they are the premium standard icons at 20, 12 and 4x bet as a 5-of-a-kind respectively for Lachesis, Clotho and Atropos. The thread and the dreaded shears pay 4x and the remaining card values 20 to 60 coins. As is usual with Playtech, the Wilds will have a big pay for all 5 and in this case fate will deliver you 200x bet! The Fate Sisters do have a gift though, when Lachesis, Clotho and Atropos appear on reels 1, 3 and 5 - they then become scatters and are locked for a single respin during which the fates pay for 2-of-a-kinds and any further ones appearing will also pay scattered according to their usual pay table awards, something you may have seen before in the free games of IGT's Da Vinci Diamonds. The Sisters also have a special bonus round for you, as we will discover. Atropos's Temple - choose her and get 15 spins starting with a random multiplier of 2 to 5x. each time Atropos appears on any reel but the middle, the multiplier increases 1x, any spin where she doesn't and it decreases by 1x. You can only get 5x maximum but if Atropos appears on the centre reel she will bestow 3 extra spins on you. 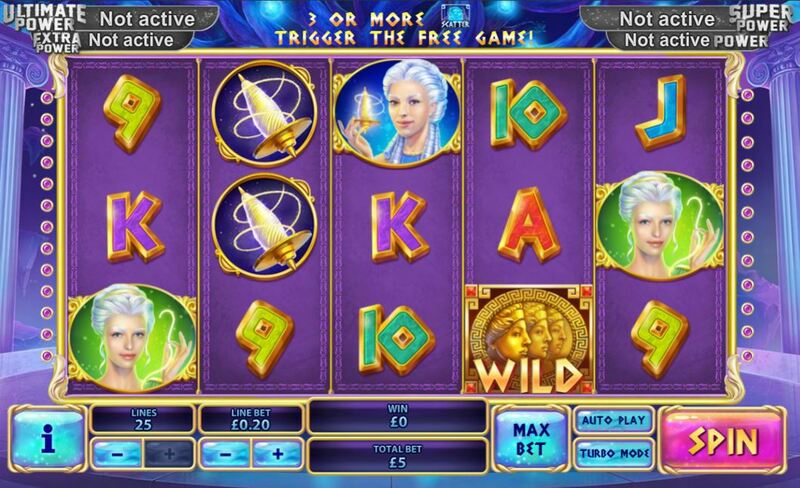 Lachesis's Temple - 10 free games where any Wilds landing will lock for 3 spins each. like Atrospos, if Lachesis appears on reel 3 you get awarded 3 extra spins. Clotho's Temple - 8 free games with 3 randomly-placed Wild added to the grid as each spin begins and as with the other Sisters, 3 extra spins if Clotho appears on reel 3.